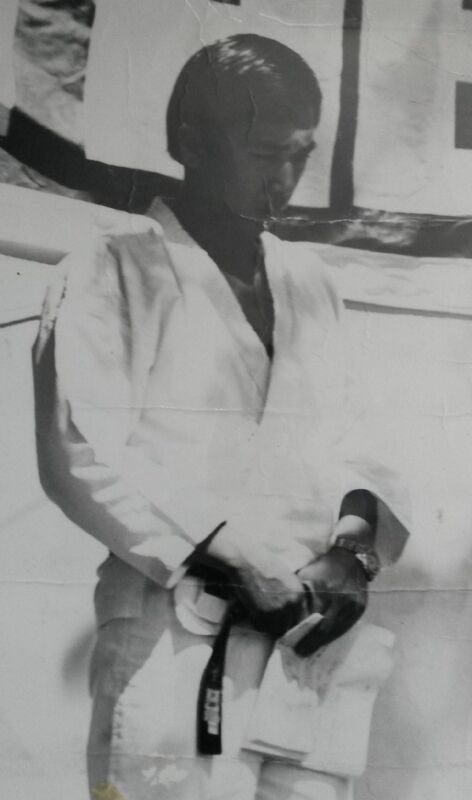 In the early 1970's Grandmaster Young Youl Oh, who had recently migrated to Australia from Korea, established Oh's Taekwondo Centre in Collingwood. Grandmaster Oh arrived as a 5th Dan Black Belt with a very distinguished background having been the Korean National Taekwondo champion on numerous occasions. He also spent a long tour of duty in Vietnam during the Vietnam War as Taekwondo instructor to the United States and South Vietnamese Military forces. In these early days, classes were run from a small premises on the 1st floor of a workshop in Wellington Street. In the mid 70's, however, Grandmaster Oh moved to a headquarters in Flemington but retained the Collingwood venue as a branch. Subsequently, the branch was taken over by Mr Henry Beayni, one of Grandmaster Oh's senior black belts. In 1987 Mr Beayni was unable to continue running the branch due to other commitments and transferred its control back to Grandmaster Oh . At this time classes were run from a community hall on the ground floor of the Collingwood high rise commission flats on Hoddle Street. Later on in the year Grandmaster Oh asked Mr Robert Pace to take control of this branch as he had four other branches with which to contend. Since then the training venue has moved a number of times. Classes were run in the Collingwood RSL Hall from 1988 to 1999 when the venue closed for refurbishment. During this time, the club commenced trading as Collingwood Taekwondo. From 1999 to 2001 classes were run from the Collingwood Leisure Centre and Fitzroy Swimming Pool. In 2002 classes moved one suburb along to one of its current locations, the Clifton Hill Primary School. The Northcote High School branch commenced operation in 2004 and with it heralded the name change to PACE Taekwondo. Grandmaster Oh, who is now 9th Dan, still presides over gradings at PACE Taekwondo and conducts many Black Belt seminars for its members. Taekwondo is a Korean Martial Art with a long history. 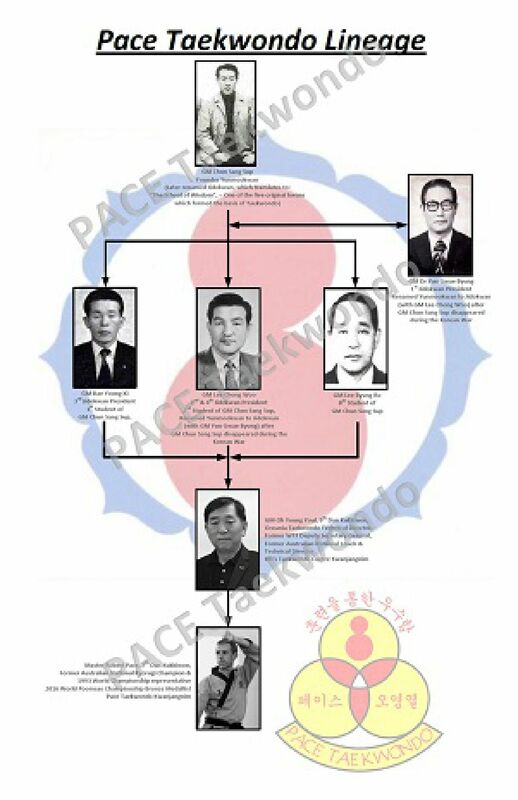 It formed via an amalgamation of 5 original kwans (schools): Chungdokwan; Songmookwan; Jidokwan; Moodukkwan; and Changmookwan. It is an effective form of self-defence that incorporates striking, blocking, evasive and manipulative techniques. These techniques create a balance of power and aesthetics as the movements tend to be circular and free flowing but with commensurate speed and power. In particular, Taekwondo has its unique kicking techniques that are both spectacular and devastating. It is a Martial Art that is constantly evolving. Taekwondo offers both physical and mental training, placing a strong emphasis on the development of moral character and spirit, as shown by the 5 Tenets of Taekwondo. Additionally, Taekwondo can provide benefits in health and fitness, and improve concentration, discipline, confidence and self-control. Pace Taekwondo can define its lineage directly to the foundation Kwans of Taekwondo. Master Robert Pace is one of the senior students of Grandmaster Young Youl Oh. GM Oh started his training in the 1950s at the Hanguk Cheyukkwan (Korea Gymnasium) in Seoul. This was the headquarters of the Jidokwan. His instructors were GMs Lee Chong Woo, Bae Young Ki and Lee Byung Ro. GM Bae Young Ki was the 1st student of the Jidokwan Founder GM Chun Sang Sup. GM Lee Chong Woo was the 2nd student of GM Chun. GM Chun was killed during the Korean War. The Jidokwan name was coined by GM Lee Chong Woo and GM Yun Kwei Byung and means "The School Of Wisdom". Taekwondo is one of two Asian martial arts included on the Olympic programme. Taekwondo made its debut as a demonstration Olympic sport at the 1988 Seoul Games, and became an official medal sport at the 2000 Sydney Games. More. The governing body of Olympic Taekwondo is World Taekwondo Federation (WTF) was founded in 1973. The first World Taekwondo Championships were held in Seoul, South Korea in 1973. Taekwondo Poomsae are a set sequence of movements that consists of the various fundamental stances, blocks, hand techniques and kicks logically arranged in a meaningful order in response to attacks from multiple imaginary opponents. Each Poomsae consists of an established sequence of movements which has a philosophical meaning, and each Poomsae has its own character and distinct quality. Poomsae teaches a student balance, technique, coordination and self-discipline. There are Poomsae competitions run at a club level, all the way through to national and international levels. With a full range of age categories from juniors to plus 65, Para and freestyle.